Don’t you hate it when you step on a thorn or stub your toe? The last few weeks I talked about the armor of God. First was the Belt of Truth, second was the Breastplate of Righteousness. 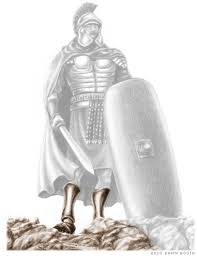 Today, I will talk about the third piece of armor: feet shod with the preparation of the gospel of peace. ‘Feet shod’ sounds funny, but it means to put on shoes. Not just any old shoes, flip flops or slippers, but sturdy protective shoes or boots. Look at a soldier’s armor. Their armor doesn’t come down and stop at the knee. Armor needs to protect all of you. 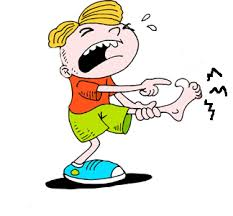 If your feet are uncovered they may get hurt causing you to stumble, fall, or become weakened. A good soldier protects his feet. He or she makes sure they wear thick dry socks and comfortable well-fitting boots. When you wear boots that don’t fit correctly or you aren't wearing thick socks you probably would get blisters. Blisters hurt! Can you think what would happen to a mountain climber who didn’t wear boots? They would slip and fall. 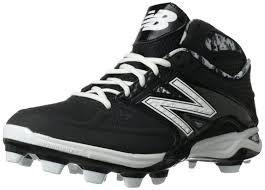 How do you think a football player, baseball player, basketball player would do without their proper foot gear? 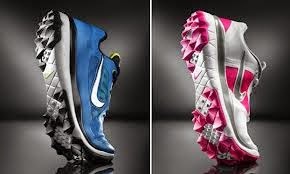 There are golf shoes to help the golfer stand without slipping. 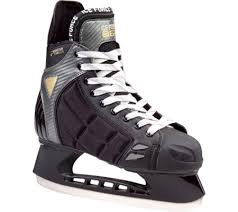 What about a hockey player without skates? This could be disastrous! The only athletes I can think of who doesn’t wear foot gear is a gymnast and swimmer. Some swimmers in the ocean wear flippers which is foot gear to help them through the water. I think foot gear, boots, or shoes is an important piece of equipment. Besides protection they are used for stability. This means a person wearing sturdy shoes or boots will not likely slip and fall. They are more likely not to be knocked over either. 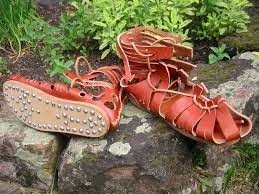 In ancient times a soldier had nails on the bottom of their shoes for stability. 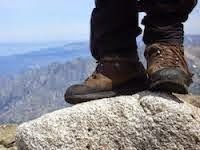 Heavy duty shoes or boots helps the person stand firmly planted. The Lord wants us to be firmly planted against the enemy. Remember, Satan is our enemy. We need to be firmly planted against his attacks. A soldier who is attacked, needs to be firmly planted so he is not knocked down. There is more to this statement of feet being shod. The Bible says in Ephesians 6: 15 and having shod your feet with the preparation of the gospel of peace. What does that mean? The gospel is the good news of Jesus bringing us life. He died for our sins and rose again so we might have eternal life with him in heaven IF we believe in Him as our Savior. To learn more about living forever in heaven READ HERE. Knowing we have the benefit of salvation or living with God in heaven someday, we can stand confidently and firmly. Salvation is peace with God. When we trust Jesus as our way to heaven we have peace with God. Therefore, when we accept Jesus we were given special foot gear called the gospel of peace. How do we make sure our foot gear is clean, polished, and ready to stand firm? We need to have fellowship with Jesus in prayer and reading His word the Bible. Reading or having someone read God’s word to you is very important. The Bible is God’s love letter to you. 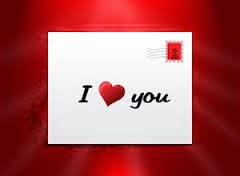 I enjoy getting a letter from a friend or loved one in the mail, e-mail, or a text and then I read it. It’s important to me to know how they are, what they are doing, or if they need me for anything. This is true with the Lord. 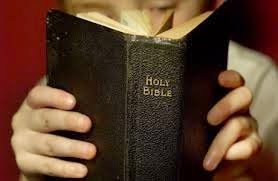 I read His word the Bible to see what the Lord has done, is doing, and will be doing. His word tells me important things like He loves me and what He wants me to do. The Bible is full of important information about how to live my life. There are cool stories of amazing people and events recorded in the Bible. The gospel of peace is an invisible pair of the coolest, most impressive, solid and protective foot gear ever. How are you doing with having your feet in some cool foot gear? 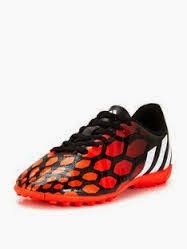 I have imagined what my foot gear looks like. Mine are gold, purple, and red and reach up to my knees. 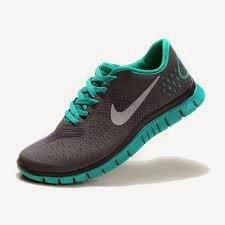 They are comfy, sturdy, and warm yet breathable. My socks are soft wool with those colors woven together. They are so cool. Put on your imagination cap and you can picture what yours might be like. You can write or draw a description of your pair in the box below. We have been memorizing this passage for the last few weeks and will continue until the study is finished. How are you coming?